I like to keep my vegetable garden trim and neat and intensively planted. Melons have a different perspective on life. They like to sprawl every which way, tumbling across garden beds and latching their tendrils onto whatever they might come across to pull themselves up. 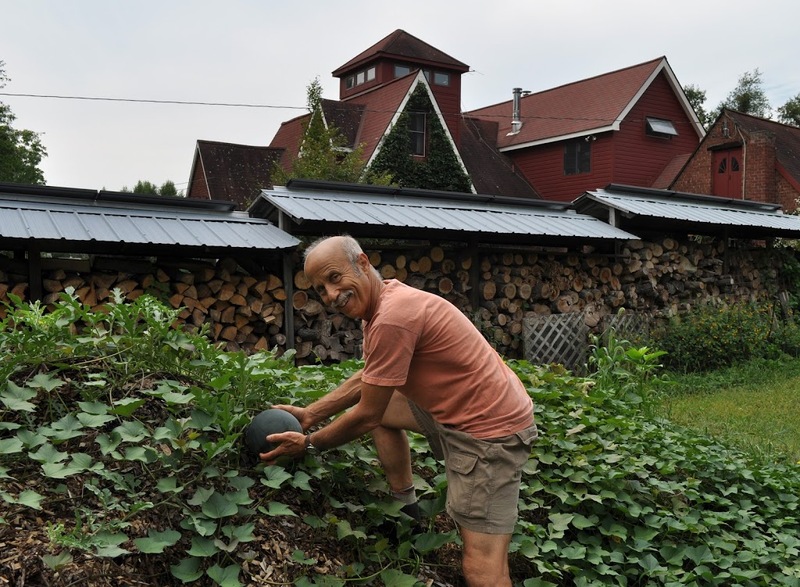 Can ever the twain — homegrown melons, here — meet? Yes, and especially this year. First, let’s look at the melons I planted in the garden. Seedlings a few weeks old went into the center of columns of concrete reinforcement wire 18 inches in diameter by 2 feet high. The idea was that the wire cage would contain the vines by letting them grow around and around the cylinder in an upwardly spiral fashion. Ripe muskmelons, the varieties Hannah’s Choice and Jenny Lind, could drop to the ground, the 2-foot maximum drop causing no harm. My melons evidently weren’t in on my plan. Hot weather in early summer spurred fast and furious growth, with new shoots outstripping my efforts at coaxing the vines around and up the cylinders. Most of the vines escaped their confines and sprawled over the bed, then onto the paths. I did manage to turn the vines inward before they overran adjacent beds. Not to complain, though. There was a good crop of melons harvested, and vines have now been cleared away and beds prepared for next spring, with everything trim and neat again. Melon-ic efforts did not end in the garden. My compost bins are, like my garden, relatively neat and trim. This is not to say that some sprawling vines couldn’t be accommodated on top of those piles. The compost isn’t needed until the end of summer or fall, anyway, and melons enjoy rich, moist soils. What could be richer and moister than pure compost? So I pulled back the corners of the coverings on a few of the compost piles and planted Hannah’s Choice and Jenny Lind seedlings there also. These melon plants grew even more vigorously than those in the garden and sprawled over the tops of the piles and down the sides. The compost pile planting was a total success. It also yielded the earliest melons, probably due to extra heat from the innards of the pile and the dark cover on the pile, and from the richness of compost. Even then my melon-ic efforts were not at an end. Every autumn I get a truckload of leaves from a landscaper, and through winter get truckloads of wood chips from arborists. The leaves and chips mostly sit in place until the following autumn when they get spread as mulch beneath trees and berry bushes and in pathways in the vegetable garden. Lately, I’ve been thinking of making some use of that pile of organic material even as it sits waiting to be spread. Last spring a year ago I planted sweet potatoes — another sprawling vegetable — in the pile and harvested some humongous, orange tubers. This past spring melons, including Blacktail watermelon, were introduced to the pile along with my new planting of sweet potatoes. Until raw organic materials start to decompose, they are relatively poor in nutrients, especially nitrogen. So instead of going directly into the pile, melon and sweet potato transplants went into holes scooped out of the pile into which I had added a few handfuls of compost. The compost would get the plants off to a good start. The melons, which are more demanding about their soil than are sweet potatoes, initially sulked and had to be encouraged with periodic watering and some additional fertilizer early in the season. The slow start was for the better. Melon plants, except for the watermelons, don’t keep bearing for a long time, and these leaf/wood chip melons brought up the end of the season with a late crop. 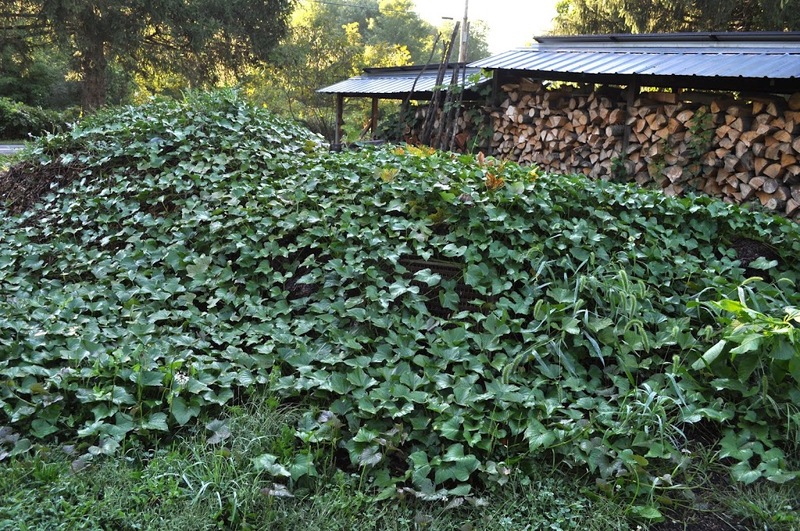 Right now, the leaf and woodchip pile is completely overrun with melon and sweet potato vines. A few watermelon fruits are still ripening atop the pile and within lurks, I expect, a good crop of sweet potatoes. To experience firsthand the possibilities in home-grown fruits, come to my workshop BACKYARD FRUITS: A TASTING AND A WORKSHOP, which will be held here art my farmden. Learn how to grow delicious fruits organically and then taste some that are in season, such as pears, grapes, pawpaws, persimmons, and kiwifruits. The workshop is Oct. 6th, 2-5 pm. Contact me for registration information. This entry was posted in Uncategorized and tagged melons, mulch pile. Bookmark the permalink. Trackbacks are closed, but you can post a comment. « Beans, Beans, . . .
What great ideas! I planted a few watermelon vines for the first time this summer, and harvested a single Sugar Baby and two teeny Yellow Doll melons (I put them in too late). I was very surprised by how much better the homegrown watermelons were, even compared to farmers market melons. I’ll be planting more vines next spring, in my compost bins! Enjoyed reading your article. Thanks.